Dish is getting into smartphone repairs. The satellite provider has announced that beginning today, anyone in the United States can request an on-site screen fix or battery replacement, and Dish will send one of its technicians out to handle the job. For now, Dish is only repairing iPhones ranging from the 5 through the 6 Plus; older phones (and newer ones like the 6S) aren’t yet part of the servicing program. But Dish will be adding more devices — including Android phones, hopefully — over the coming weeks and months. The company claims to use “high-quality replacement parts from respected third parties” for its repairs, and Dish’s employees will go pretty much wherever is most convenient for you. Prices start at $74.99 for a battery swap and go up to $224.98 if you’re replacing both the display and battery in an iPhone 6 Plus. 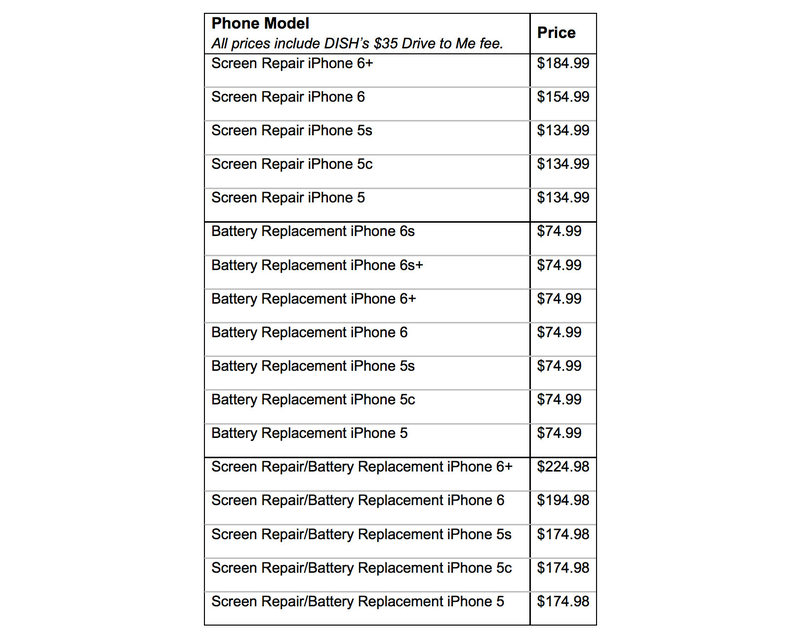 If you’re only interested in screen repairs, those cost $134.99 for 4-inch iPhones, $154.99 for the iPhone 6, and $184.99 for the 6 Plus. That might be a little more expensive than having those same components replaced at a sketchy kiosk at your local shopping mall, but again, Dish is willing to come to you. “Fixing your phone shouldn’t mean losing your phone for days on end, so we come to you — whether you’re at the office, the gym or even the coffee shop,” John Swieringa, Dish’s executive vice president of operations, said in a press release. Appointments can be scheduled in two-hour windows for any day of the week (with same-day and next-day options available), and Dish is backing its work with a 60-day warranty. There’s a $35 “Drive to Me” fee, but that’s baked into the pricing reflected below. And once that fee is covered, a Dish technician isn’t limited to repairing just one phone; they can repair several on the same trip, so the company is also pushing this on corporate events. From the web, you can check your technician’s name, see a photo, and even track the vehicle as it approaches you. It all makes total sense if you think about it; Dish has a huge fleet of techs throughout the country, and this is yet another task they can handle to complement satellite installations and whatever else. Now the question is whether Comcast and other TV companies will also turn into smartphone repair companies. I guess that all depends on how much success Dish finds. So then let me ask you: would you use something like this?